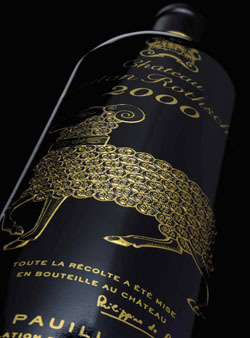 The 2000 Mouton Rothschild is re-approaching its record 2011 level of over £10,000 a case as Mouton continues to be the most consistent first growth. Liv-ex has noticed that the first growth’s millennium vintage is now trading at £10,300 a case, just £100 away from its mid-2011 high having experienced a dip in fortunes like most other Bordeaux in the intervening two years. Of all the premier crus, Mouton has proven to be the best performer in recent years, its index outperforming its fellow firsts with a 3.1% rise in the year to date, its second wine (Petit Mouton) is also the best performing second wine among the firsts. In the recent Liv-ex Power 100, printed in association with the drinks business, Mouton showed a resounding recovery between last year and this one, jumping nine places from sixteenth to seventh and accounting for 8.93% of trade by value and 4.68% of trade by volume – second only to Lafite. All this at a time when the sister Rothschild estate has seen prices for its stable slump back to 2010 levels. Interestingly, the 2000 vintage falls in a bracket, formerly identified by Liv-ex, of Mouton wines which have the highest prices but also the lowest scores. The index had previously identified Haut-Brion as having the best average price-to-score ratio when vintages from 1998-2012 were taken into account. Although Mouton’s scores have improved in recent years and prices remain low, the wines made between 1998 and 2002 have the highest prices (around £4,700 a case) but also the lowest scores (93 on average courtesy of Robert Parker). Nonetheless, the 2000 continues to climb steadily despite only having a score of 96 and being more expensive than other highly regarded vintages such as 2006, 2009 and 2010 (all of which have scores of 98+ or more too). It is likely that the “striking black and gold ram label design ensures that it continues to appeal to an Asian market,” Liv-ex speculated.